In this series, food writer, wine lover and cookbook obsessive Kristin Donnelly test drives the most fun and inspiring new books that come across her desk. Two years ago, I edited a few recipes from Valerie Gordon, owner of Los Angeles-based Valerie’s Confections, and she was the best kind of perfectionist: When she saw that her sensational brandy-mascarpone semifreddo we made in our test kitchen didn’t look as amazing as her own, she panicked (a little) and immediately fixed the recipe to make it even more home cook friendly. 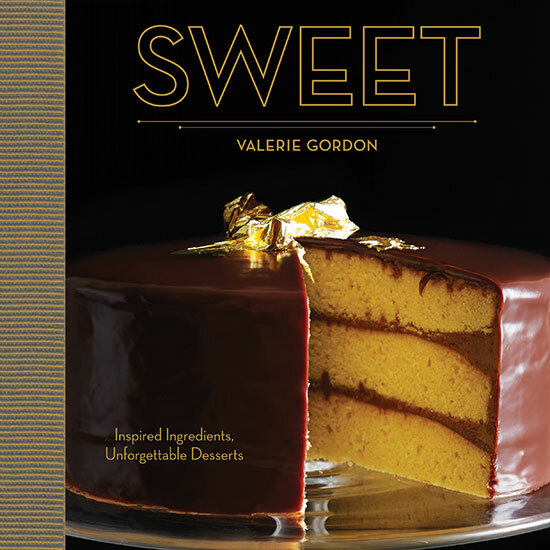 After being a fan of her understated and beautiful chocolate-enrobed toffee for years and trying out her recipes for the magazine, I was thrilled to learn that she was writing a book. Finally, finally, that book, called Sweet, is here. I’m not an avid baker nor do I have a big sweet tooth, but I can’t help from wanting to try every recipe. Perhaps it’s the way Gordon elevates homey desserts in genius but super simple ways: For example, she makes the pastry for her apple crostata (a free-form tart) with butterscotchy, orange aged gouda cheese and adds smoked salt and cocoa nibs to her oversized chocolate chip “Durango” cookies. For people who like a challenge, she includes plenty of show-off recipes: The Hazelnut Cake (a simple name that belies this decadent dessert) includes four layers of cake that are layered with ganache, enrobed in a bittersweet chocolate glaze and topped with candied hazelnuts. Her recipes are so clearly written, however, that even intimidated bakers will feel empowered to try them. Perhaps most exciting is her chapter of recipes for forgotten historical cakes, which she makes at her shop but does not ship. I can now try the famous Blum’s Coffee Crunch Cake—a famous old-school Los Angeles cake covered with coffee whipped cream and studded with a coffee honeycomb crunch—in my own kitchen and have no doubt that it will be perfect.